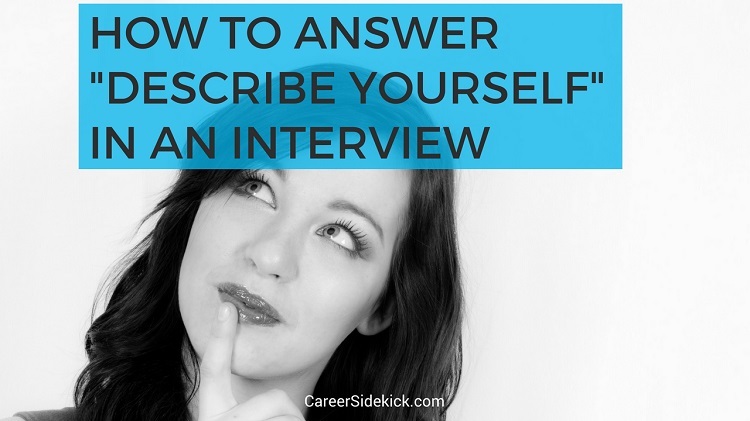 A lot of interviewers will ask you to describe yourself as one of the first questions in your interview. I’m going to walk you through the best ways to answer, some examples, and the common mistakes to avoid. The general idea when answering is you want to sound positive, impressive and RELEVANT for their job. That last part is super important. So think from the employer’s perspective and read the job description before going into your interview to help you with this. If the job requires a lot of multi-tasking and handing high-pressure situations (you’ll know from the job description most likely), you’ll want to describe yourself as someone who works well under pressure. I personally do NOT work well under pressure. But I’ve still said it in interviews because I knew they wanted to hear it. And the job didn’t end up being very high pressure anyway. If you’re concerned that the job isn’t the right fit, don’t take the job. But your only goal in the interview should be to get invited back for the next round, or get a job offer. And this is how to do that. Let’s say they ask the same question – “describe yourself”, and you noticed during some research that the job requires a lot of teamwork and collaboration. It’s not a job where you sit quietly and work by yourself all day. So in your answer, you’d want say you’re collaborative, you enjoy working as part of a team, etc. And then give examples. I mentioned earlier this question is about your personality, but it’s also a chance to highlight experiences and specific things you’ve done. That’s how you stand out when answering “describe yourself” in your interview. Choose whichever suits you best, and just remember that you can repeat this in every interview. Whatever you pick, have an example and a reason for why you chose it. Don’t just say one word and then stop talking. This is a question where they’ll want you to explain your answer. It’s always great if you can end your answer by explaining why you applied for the position and showing them you really did your research. Sure, it’s more than they asked, but it’ll impress them. Don’t ramble on. Try to keep your answer to 30-60 seconds and keep your train of thought when you describe yourself. This is a common trap for this question, and also questions like “tell me about yourself“. If you ramble on, they’ll take it as a sign you can’t keep a clear train of thought and are difficult to communicate with. If they think this, they are *not* going to hire you. That way you’re not stopping before they’re satisfied, but you’re not rambling on for an extra two minutes after they’ve heard everything they wanted to know (doing this will frustrate the interviewer FAST and is a common mistake). Overall, if you follow the tips above you should pass this question easily and move on to the rest of the interview. Just keep your answer targeted, brief, and don’t be afraid to ask for feedback to see if you gave enough info.